I belong to a generation that has often felt abandoned by G-d and betrayed by mankind. And yet, I believe that we must not give up on either. Was it yesterday – or long ago – that we learned how human beings have been able to attain perfection in cruelty? That for killers, the torturers, it is normal, thus human, to act inhumanely? Should one therefore turn away from humanity? The answer, of course, is up to each of us. We must choose between the violence of adults and the smiles of children, between the ugliness of hate and the will to oppose it. Between inflicting suffering and humiliation on our fellow man and offering him the solidarity and hope he deserves. Or not. I still believe in man in spite of man. I believe in language even though it has been wounded, deformed and perverted by the enemies of mankind. And I continue to cling to words because it is up to us to transform them into instruments of comprehension rather than contempt. It is up to us to choose wether we wish to use them to curse or to heal, to wound or console. In front of me, the cemetery; behind me, the garden of my childhood. The future is shrinking; the past is dying. 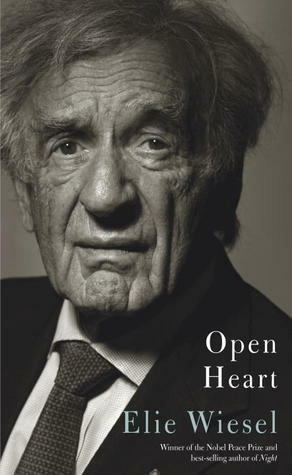 In June – 2011, 82 year old Elie Wiesel is told he needs emergency open-heart surgery. Faced with this diagnose, Elie Wiesel reflects back on his life and his own mortality. Open Heart is Elie Wiesel memoir of this time. We sanctify life, not death. “Ubakharta bakhaim,” says Scripture: “You choose life” and the living. Unlike the heaviness of Elie’s other reads, Open Heart is softer, more settling. His words are peppered with hope and speak life. Elie’s voice in Open Heart will resonate with many of us who have more years behind than ahead of us or for anyone who has reflected on their own mortality. All my life, until today, I have been content to ask questions. All the while knowing that the real questions, those that concern the Creator and His creation, have no answers. I’ll go even farther and say that there is a level at which only the questions are eternal; the answer never are. Deeply intimate and profoundly moving, Open Heart is a short read, only 79 pages long. Though Open Heart can easily be read in one sitting, it is one to go back to time and time again. I am not the man I was before June 16, 2011, but on a level close to the absolutes that are life and death, I have remained the same. What is different is that I now know that every moment is a new beginning, every handshake a promise. I know that every quest implicates the other, just as every word can become prayer. If life is not a celebration, why remember it? If life – mine or that of my fellow man – is not an offering to the other, what are we doing on this earth? Found this a great inspiring read…….everything is inter-woven and it’s up to us how we re-act, how we carry on. Love what Elie Wiesel says “That we must Sanctify Life” in all we do. Thank you! ((((Jenny))))) you are so welcome!